Satel-light results from a European Project Team (www.satellight.com ), which has used data from the METEOSAT Geostationary satellites, and provides detailed Irradiance (and also Illuminance - useful for natural lighting studies) time series in half-hourly values for 5 complete years (1996 to 2000) and for any pixel of about 5x7 km² in Europe. These data have been carefully prepared, involving complex treatment of multiple satellite photographies in several wavelengths. They exhibit an impressive accuracy, of around 20% (RMSE) without significant bias, far enough for the simulation needs in PVsyst. It has been established that in hourly values, as soon as a considered site is more than 20 km apart from a terrestrial meteo station, the satellite data are of better quality than the measured terrestrial ones (i.e. the RMSD - Root Mean Square Differences - are lower), while the MBD (mean bias differences) averages remain very close to zero. 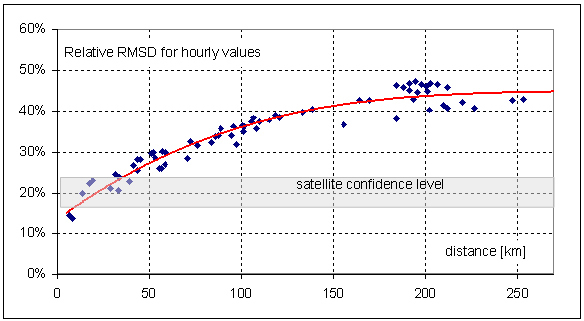 The following graph shows comparison difference RMSD, between terrestrial measurements of several stations of the ISM network (Swiss Meteo Institute), showing the effect of the distance between a site and the use of the data. This also gives a comparison with the Satellight confidence level, lying around 20% (which has become even better with the latest developments of the models).